A baseball layout created with wonderful papers from Scrappin Sports Stuff. They have such a wonderful collection of sports stuff for any sport you can think of. Well, because of Thanksgiving coming up, we decided to hop on Tuesday this week. Ah the colors of a beautiful winter day. That is the inspiration for this card. 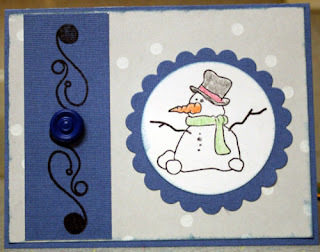 This Snowman stamp is one of my favorites and I chose to lightly color him with pencils and mount him on a scalloped circle. The flourish was a perfect addition to the side of the card. In case you didn't know, Queen Kat has just created some stamps for the Twilight fans in all of us. 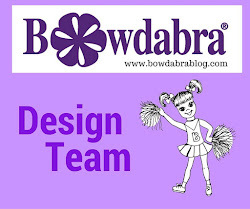 Stop by the store and check them out, then stop at everyone's blog for some amazing creations. This is my first DT layout for ScrappinSportsStuff. 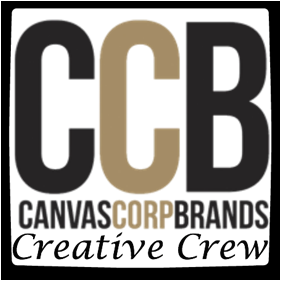 Check out their store for some amazing sports related products. Did you realize that it's QKD 3rd anniversary???? Woohoo, how exciting is that. 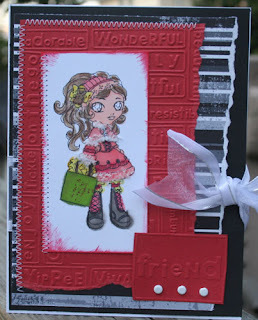 QKD has so many wonderful stamps and Kelly Kost has created the stamps we are showcasing on today's blog hop. I hope you got here from Nancy's awesome blog, but if not, start at the top and begin again. You certainly don't want to miss any of these projects. 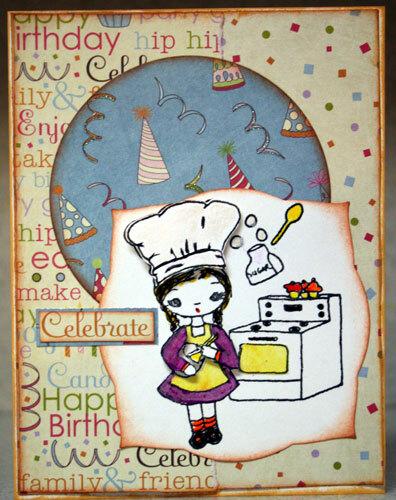 My stamp was titled the Baker so I created a birthday card - who doesn't love to bake for a party!!!! 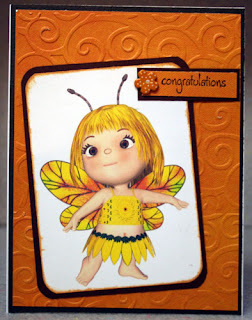 Since I just got some new Cuttlebug embossing folders and some wide ribbon, I just had to showcase her again. 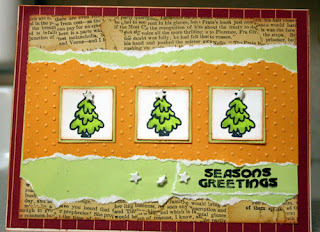 Now head on over to Helene's blog and see what she has in store for you. 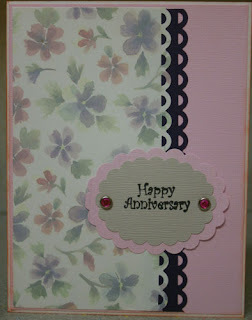 It's another blog hop Wednesday and it's QKD anniversary celebration. Today's challenge from Queen Kat was to use the colors: purple, pink, grey, white, and since we are celebrating Queen Kat's 3rd anniversary, I thought an anniversary card was in order. So I used the Spring Love set. And there are sales at the store, so be sure to check them out. Use coupon code BL10at check out and receive an additional 10% off your purchase!! 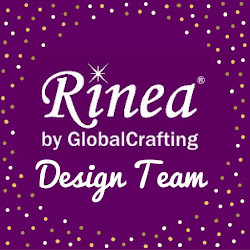 This includes kits, clearance, stamps, and well.. EVERYTHING in the store!! (If you're purchasing a kit subscription, the discount applies to the first month only.) Have fun shopping. This is another digi image from Aisne's Creations and she is so cute. 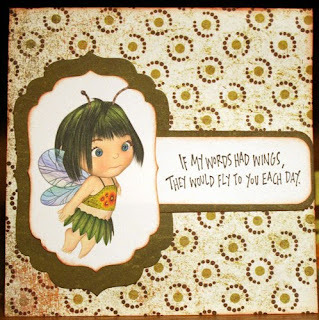 Many of these fairy images can be used for so many different cards. 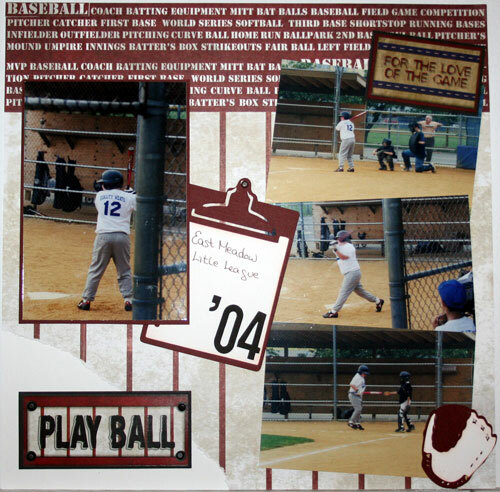 Check out this cool digi image from Aisne Creations - totally sweet!! 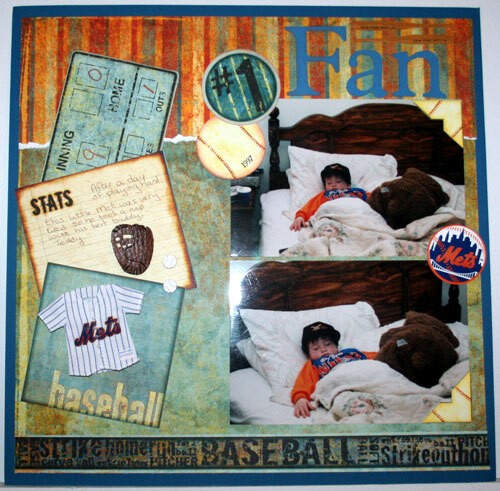 Wouldn't it make a great baby card. Morning everyone. Over at Queen Kat Designs Store, the challenge was to create a 3D Thanksgiving item using the color red, 2 Queen Kat stamps and 2 embellies. So I created this candy bar wrapper with the wrong colors!!!! That'll teach me to read directions!!! Oh well, someone will love it any way. Go check out the store, there are some fabulous sales going on. Another card I've been working on. Since I don't drink coffee, I had to adapt this QK stamp to my needs. 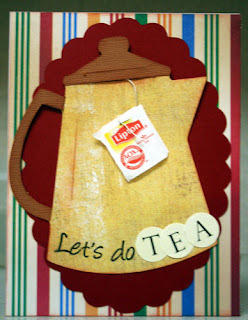 So easy to do too - I just covered coffee with stickers that spelled tea and my card is all set. Of course, I cut it out with my Cricut and From My Kitchen cartridge. 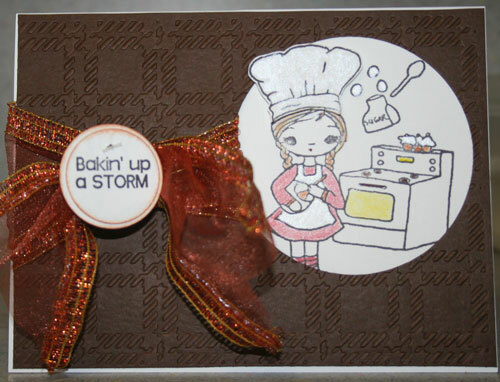 Check out these cards I made with Queen Kat's Ride with me stamp set. Full of tons of images, some of them, like the Christmas Tree, Pumpkin, Black Cat and Witches hat, are perfect for creating "inchies". Go see what Queen Kat has in store today. 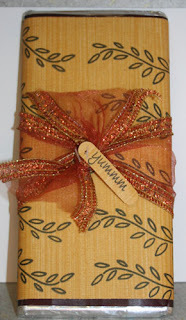 It's time again for another Queen Kat Wednesday blog hop. Check out all the awesome creations by the team. 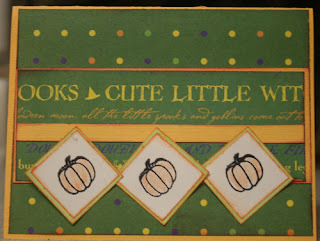 And there is a sale this week: buy 2 stamp sets and get 1 separates stamp free ($3.99 or less) or buy 3 separates get 1 free. How awesome is that!!! Now onto my stamp who is appropriately named: Peppermint. Isn't she sweet! And mark you calender to check out Queen Kat's Birthday hop on November 19th. You won't want to miss it!!! 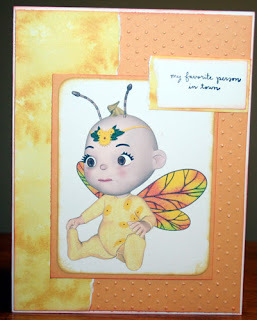 Isn't this fairy adorable??? I just love it. It's one of a series of digital images created by Aisne's Creations at DigiScrap Station. Digital image: Aisne's Creations at DigiScrap Station.